At A & P Fencing we stock only the finest seeded garden turf. Delivered fresh to our depot daily, our lawn turf is thick, beautifully green and long lasting. Easy to lay in your garden, you can have your garden looking perfect in no time. Why not lay your new lawn on some of our high quality top soil? Need help working out how much turf you need? Our garden turf calculator will be absolutely perfect for you. 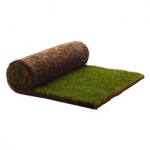 We have a range of garden turf listed below. They are available for fast delivery from our West Midlands depots to popular locations including Birmingham, Sutton Coldfield, Great Barr, Tamworth, Lichfield and more.